Katy Jade Dobson explores the natural world in her elegant oil paintings imbued with vivid bursts of colour. 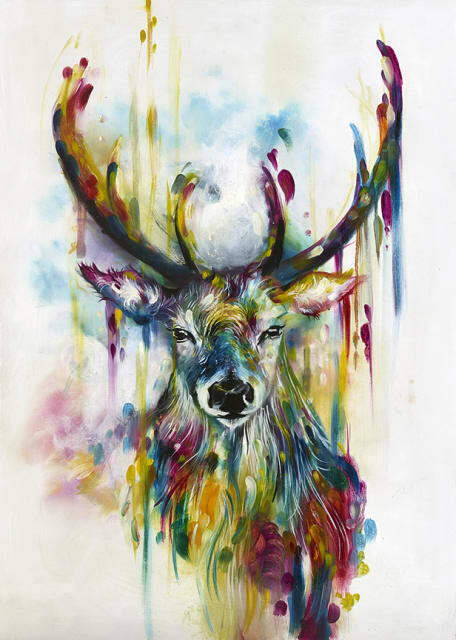 Taking animals, wildlife scenes and female figures as her subjects, Dobson brings canvases to life with a rainbow palette, intricate detailing and spontaneous and kinetic overtones. Drawing inspiration from the ethereal qualities of Odilon Redon and applying her love of wildlife to her art, Dobson carefully blends drama and harmony to capture ferocious predators, graceful birds and other majestic creatures in a moment in time. Browse and buy our collection of limited edition Katy Jade Dobson prints for sale here. Originally from Yorkshire and currently residing in the town of Lincoln, Katy Jade Dobson spent her childhood nurturing her passion for art with a self-taught approach to portraiture and sketching. She pursued this interest throughout school and onto the University of Lincoln, where Dobson was able to develop her skills with the addition of theory and art history. Dobson’s artistic journey accelerated in 2011, when she bought her first canvas to work on. She created a large-scale mixed media painting of two birds in flight and ultimately sold the piece, the first time she’d managed to do so. After working as a barmaid for two years, Dobson began painting in a range of mediums and attended art events and fairs to showcase her work. Her wildlife paintings were received extremely positively, which led to Dobson opting to paint primarily with oils thereafter. In 2013, having found her feet and individual style, Dobson began working as a professional artist. Dobson is a passionate animal welfare supporter, which is a clear influence in her work. Enticed by their strength, elegance and regal qualities, stags were originally Dobson’s subject of choice, but many other animals have since found their way onto her canvases. She regularly paints birds and has perfected the intricate skill of capturing the movement of wings mid-flight, while other species including elephants, tigers, bears and sharks have become more recent focal points. French symbolist painter Odilon Redon has also been cited as one of Dobson’s greatest inspirations. She studied his work while at college and became fascinated by his use of colour. His work is not an exact reflection of life, but is representative of power, movement and feeling, something Dobson tries to convey in her own work. Dobson’s technique means that no two paintings are created in the same way. Each individual piece has seen its own process of layers being added and removed, with the final outcome dependent on intricate changes like brush size, colour palettes and temperature. More recently, Dobson has been involved in charity fundraising through the sale of her work, raising money for Women’s Aid and the Marine Conservation Society among other not-for-profits.